Singin' In The Rain! 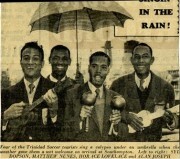 : Four of the Trinidad Soccer tourists sing a calypso under an umbrella when the weather gave them a wet welcome on arrival at Southampton. Left to right: SYL DOPSON, MATTHEW NUNES, HORACE LOVELACE and ALAN JOSEPH. Like most other people, I tend to hero worship extraordinarily talented people, whether they be in sport, music or any other noble cultural field. The passing of Matthew Nunes brought me right back to the year 1956, when I was just in my final year of college and had joined the great Maple Club. In those days, great sportsmen were recognised even more than the politicians of the land, regardless of what their profession was or where they lived. Nunes was the person whom I chose to emulate on the football field. I make no apologies to admit that many times, when I played on the same team as he did, I caught myself in a trance as this modest and humble master of the art of dribbling and passing would mesmerise the thousands of fans who travelled to the Grand Savannah to witness matches among the clubs in the North of Trinidad. On numerous occasions, tough defensive teams would plan a course of action for the cavalier, carefree, ball wizard—a challenge which Nunes enjoyed immensely as he wended his way in and among the late tackles towards the opponents goal. 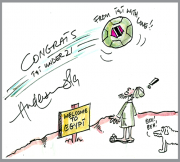 Advice from the former national inside left was precious and it was always followed by his superbly clinical manoeuvres in a fashion which only Matthew Nunes could produce. He was selected for the T&T national team’s first and only tour of England in 1953, where he excelled to the point that, together with another great player Shay Seymour, he was given a contract to play for clubs in England. Academically brilliant, Nunes returned to T&T after six years in England and used his education in accounting to join Texaco, but continued his love affair with football. His age may have challenged his natural talent, but no one noticed the difference when he took the field with the Maroon and Gold shirt of Maple and brought happiness to the fans of the 50s and 60s. I felt honoured to have been on the field with names like Nunes, Alan Joseph, Conrad Braithwaite and Hugh Sealy (all deceased). The lessons which they have taught should have been recorded, if only because much of it could have been utilised in today’s setting. Some will claim that the world would have recognised the ability of Nunes ten fold if he was not a typical Trini whose lifestyle was mixed with the regular evening beverages among his friends. The latter part of his life was spent in New York and much of his contribution only remained with those of us who were present to witness his absolute prowess. May you rest in peace my friend. Matthew Nunes passed away on Sunday in New York, USA where he lived. He was 86.